You may want to relist a job after it has expired so you can collect applicants into the same pool for easy management. To relist a job, visit My Dashboard and simply hover over the name of the expired job and a link to ‘Relist’ will appear under the job name. After you click “Relist,” you will be asked to choose a job package. If you have a current package, you may choose to use that or select a new package. For example, you may want to relist the job as a Featured Job to get more exposure. To do this, click the Single Featured Posting package. The relisted job will now be featured for the next 30 days, and you will still keep any remaining jobs from your previously purchased package. You can also take this opportunity to buy a 2 or 3 Job Package. 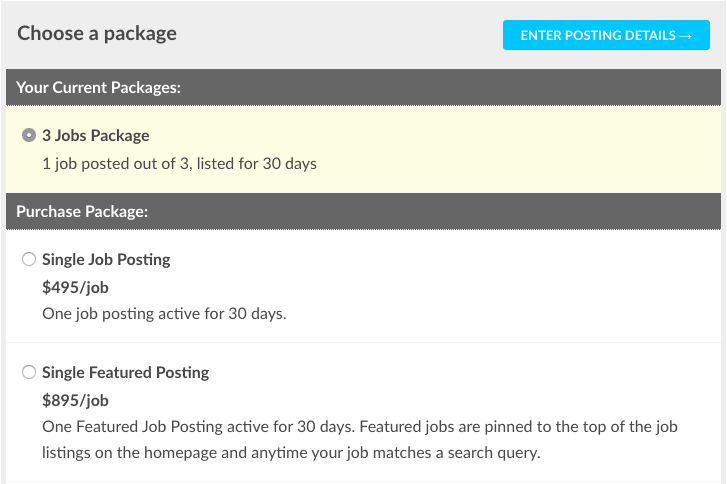 Purchasing a 3 Job Package will save you money the next time you need to post a job or relist an existing job. More information on choosing job packages here.